Are you a writer? What’s your experience with the end of the writing process? The fine-tooth combing, the “is it ready to show others?” moment, the “is this publishable?” question. As part of the Bluffton Public Library’s celebration of NaNoWriMo–National Novel Writer’s Month–I will be exploring copyediting tools with writers of all kinds. I’m going to help them find their inner copyeditor and use new ways to polish their fiction or non-fiction writing. But what does a copyeditor do? In a nutshell, copyediting is a review and revision process that results in more correct and effective writing. The copyeditor looks at clarity, style, and organization, as well as spelling, punctuation, and grammar. In a best case scenario, the writer then approves or rejects suggested revisions and responds to questions posed by the copyeditor. Copyediting is distinct from proofreading, which is limited to correcting errors as a final step before printing or posting electronic text. It’s tricky to serve as your own copyeditor because you can never become a truly objective reviewer. However, you can use editorial tools to single out technical issues and give yourself a new way of looking at your writing. I’ll be sharing both old-school techniques and new technology tools to help you find errors, unintended repetition, awkward construction, inconsistencies, and other writing pitfalls. The books by King and Saller are fun to read rather than stuffy how-to books. The links are practical reference tools. 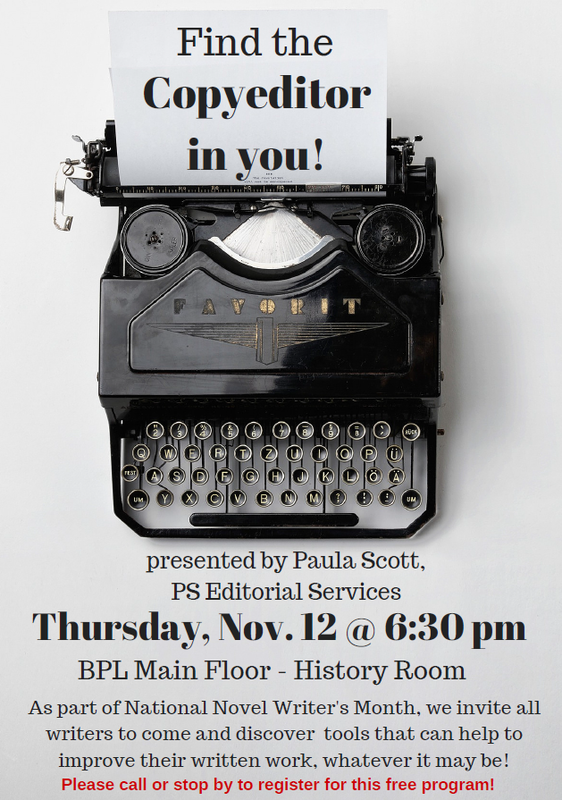 But if you have a manuscript languishing in a real or virtual folder, I hope you’ll join us at the Bluffton Public library at 6:30 p.m. on Thursday, November 12. Call (419) 358-5016 to register or sign up while you’re at the library!